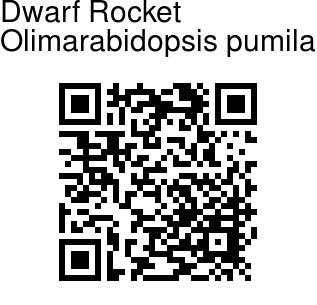 Dwarf Rocket is an annual herb, 5-40 cm tall. 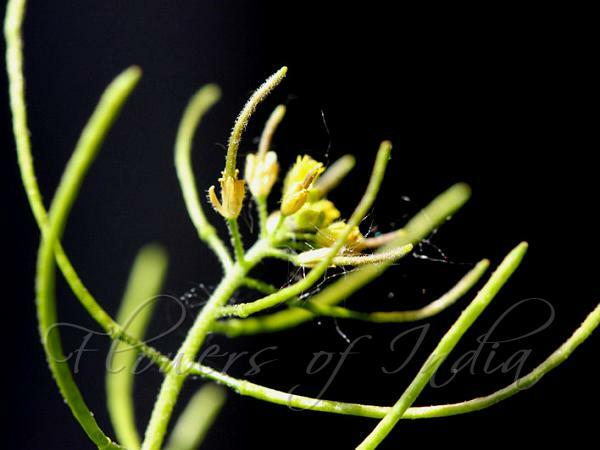 Stems are erect, simple or few branched at base, velvety with short-stalked or stalkless hairs, rarely hairless distally. Basal leaves are not rosulate, stalked, often withered by fruiting, velvety as stems. Leaf-stalks are 0.8-2 cm. Leaves are inverted-lanceshaped, spoon-shaped or lanceshaped, 1-8 x 0.5-2 cm, margin coarsely toothed, rarely pinnately cut or entire, tip pointed. Middle stem leaves are oblong, ovate, or lanceshaped, stalkless, 1-5 cm x 4-12 mm, base eared	or rarely arrow-shaped, margin coarsely toothed or rarely entire, tip pointed. Fruiting stalks are diverging, ascending, or strongly reflexed, 2-7 mm. Sepals are oblong, 1.4-2 x 0.3-0.8 mm, velvety. Petals are yellow, turning whitish when dry, spoon-shaped or inverted-lanceshaped 2-2.5 x 0.3-0.8 mm, attenuate to base, claw absent. Filaments are 1.3-1.8 mm, anthers oblong, 0.2-0.3 mm. Fruit is linear, round, curved or straight 1.5-3.2 cm x 0.8-1.2 mm. Dwarf Rocket is found in Afghanistan, India, Kashmir, Kazakhstan, Kyrgyzstan, Pakistan, Russia, Tajikistan, Turkmenistan, Uzbekistan and SW Asia. Flowering: March-May.